Highly recommended, Part P registered, Electricsafe Electrician Bristol. Hi. 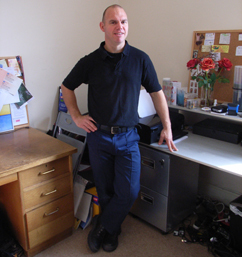 My name is Bryan and I am a fully qualified, domestic & commercial electrician, who moved to Bristol on April 1st 2008. I am originally from New Zealand and gained my qualifications there after completed a four year electrical apprenticeship but I have been living in the UK (Brighton & Bristol) for the last ten years. I completed my City and Guilds 16th edition electrical examinations as soon as I arrived in the UK and have since become JIB approved and completed City & Guilds 2391 inspection and testing examinations in 2005. I have been Part P registered since May of 2007 and last year I upgraded my 16th edition electrical regulations certification to 17th edition (BS7671:2008 - Electrical wiring regulations or Requirements for Electrical Installations). After completing my apprenticeship in NZ, I continued working for Williams Hickman Electrical as a tradesman for approximately two years. While I was at W.H.E, I was in charge of many contracts including domestic, commercial and industrial constructions and I also worked with their servicing department on regular occasions doing rewires, refurbishments, and general call out jobs. On the whole I consider my time well spent with W.H.E as it gave me a wide range of electrical skills, ranging from socket outlet and light installation all the way through to switchboards (consumer units), data cabling (cat 5e), industrial switchgear, roller doors and basic PLC programming. After leaving W.H.E, I set up my own business in a small town north of Christchurch called Cheviot. Whilst there I learnt all about how to run your own business and varied my experience even more. Being a small town some distance from the city, an electrician can be called on to fix and tune appliances, install aerials, wire sub mains, energize pumps, and any number of other electrical jobs which are normally suited to more specialized tradesmen and one is constantly needing to learn more, to keep up with the demands placed on any individual who may be able to extend their services to suit. When I decided that I wanted to travel abroad, it was necessary to go and work in the city to increase my workload and I did this for almost a year and a half before leaving for Sydney, Australia. Whilst there I subcontracted for Hobbs Unlimited and worked mainly on commercial developments such as pubs, nightclubs and residential housing/ apartments. We also did the servicing and maintenance for several car wash bays which I found very interesting. From there I moved to the UK and in my first year spent in Brighton, I worked as a temp' for Hays Montrose. I helped on a major rest home refurbishment for L & F Electrical Services and completed preventative electrical maintenance inspections for Baileys Maintenance Services, who were contracted to Southern Water. Since starting my business here, I have done many house rewires, kitchen refurbishments, metal conduit installations, new consumer units/ fuse boxes, periodic and full installation inspections and upgrading of electrics to the latest BS7671 Electrical Wiring Regulations standard. As it is now a legal requirement to be Part P certified to work on domestic installations, I have also become a member of (The) National Association of Professional Inspectors and Testers (NAPIT) and send regular notifications to them for domestic jobs requiring notification. Recently (April 2006 - April 2007) I have been back to Australia and New Zealand, to show my partner (Sandy) how we live over there. However, after a year of sunshine and travel it was necessary to buckle down and get some work done and I have been working successfully in Brighton & Bristol since April of 2007. A lot of my work in Brighton was attained through my membership with a vetting and monitoring company called Checkatrade. Unlike most referral companies found on the web, Checkatrade is the only reputable monitoring service I could find who actually follow up on references and customer ratings, to ensure they are legitimate. Unfortunately Checkatrade does not advertise in the Bristol area yet but they have assured me that they intend to be doing so in the near future. For work purposes I am also a member of several other web directories such as Free Index, Find me a tradesperson, Local Surveyors and several other feedback sites. Of these Checkatrade is the only one which has asked for proof of my qualifications and verified any of my customer ratings. In October of 2007, my girlfriend obtained work in Bristol. We agreed that as her job is more specialised and her work location is more limited, if she wanted to remain in Bristol after six months I would move to Bristol also. As a result, I relocated my business on the 31st of March (2008) and am now operating from a premises centrally located in Redland (BS6) Bristol. I would like to take this opportunity to thank all of my wonderful clients and friends in Brighton, who made my time there worthwhile. I enjoyed my time in Brighton immensely and was sad to leave, as I have made many friends (both in and out of work) in this fabulous seaside town. As some of you know, I return on a semi regular basis so feel free to call me if you have any non urgent work you would like me to complete. Take care guys. So there you have it, BZ Electrical is now based in Bristol. So to all you Bristolians, if you would like to have some electrical work completed by a responsible, hard working & friendly electrician - give me a call. Jobs I do on a regular basis include: Consumer units, fuse boxes, fuse boards, splitload consumer units, residual current devices, RCD installation, RCBO installation, circuit breaker installation, Installation certificates, Periodic inspection certificates, Landlord certificates, Domestic minor works certificate, notification of work, certification, landlord safety checks, kitchen upgrades, kitchen refurbishment, kitchen rewires, kitchen sockets, House rewiring, flat rewiring, rewires, new cabling, portable appliance testing, certifying DIY electrics, upgrades to comply with BS7671:2008, 17th edition upgrades, new switchboards, PIR sensors, sensor lights, testing, certification, insulation resistance tests, loop impedance tests, continuity tests, polarity, plugs, sockets, lights, switches, spurs, enclosures, conduit, trunking, capping, halogens, low voltage transformers, LED lights, outside lights, garden lights, power to sheds, rewires, isolators, telephone outlets, telephone cabling, sub mains, relays, two way switching, three way switching, stoves, appliances, lamps, florescents, strip lights, bayonet cap, fans, expelleirs, range hoods, entertainment equipment, spotlights, outdoor circuits, weatherproof fittings, picture lights, down lights, track lights, sensors, smoke alarms, warning labels, earthing, clamps, earth bars, earth straps, cable installation, crimping, tagging, fuses, neon fuse spurs, dimmers, remote control light switches, stove isolators, cookers, hobbs, surface wiring, pattresses, pull switches, pendants, door bell circuits, IP65 outlets, junction boxes, connections, labeling, basic plumbing, showers, instant water heaters, car stereos, etc. Places I am willing to work in Bristol include: BS6, Redland, Westbury Park, Golden Hill, Cotham, Henleaze, Kingsdown, Tydalls Park, Montpelier,St Andrews, Bishopston, Ashley Down, BS8, Clifton, Clifton Down, Clifton Wood, Victoria Park, Failand, Leigh Wood, Abbots leigh, BS9, Sneyd Park, Stoke Bishop, Westbury on Trym, Sea Mills, Coombe Dingle, Eastfield, BS7, Horfield, Lockleaze, BS10, Southmead, Brentry, Henbry, Botany Bay, Blaise Hamlet, Lawrence Weston, BS3, Bedminster, Ashton Gate, Ashton Vale, Windmill Hill, Totterdown, Lower Knowle, Filwood Park, Knowle, Upper Knowle,Kensington Park, Kensington Hill, Brislington, Broom Hill, BS5, Upper Easton, Lower Easton, Russell Town, Barton Hill, Whitehall, Rose Green, Crofts End, Moorfields, Redfield, Netham, Pile Marsh, St Anne's, St Anne's Park, Crew Hole, St George, Whiteway, Burchells Green, Speedwell, Hillfields, Stapleton, Fishponds, BS11, Shirehampton, Avonmouth, BS13, Bedminster Down, Headley Park, Highridge, Bishopsworth, Withywood, Hartcliffe, BS14, Hengrove, Whitchurch, Stockwood, BS34, Northville, Filton, Filton Abbey wood, Parkway, Broadmead, BS20, Pill, Easton in Gordano, Portbury, BS32, Stoke Gilford, Great Stoke, Little Stoke, BS36, Winterbourne, Flaxpits, Hicks Common, Frampton Cotterwell, Coalpit Heath, Ram Hill, Henfield, BS16, Frenchay, Blackhorse, Vinny Green, Emerson's Green, Mangotsfield, Pomphrey, Shortwood, Upper Soundwell, Soundwell, Lower Soundwell, Cockshot Hill, New Cheltenham, Siston Common, Warmley Hill, BS37, Yate,Mayshill, Westerleigh, Wapley, Chipping Sodbury, BS15, Patterswood, Kingswood, Woodstock, Mount Hill, BS30 Warmley, Cadbury Heath, North Common, Barrs Court, Oldland, Oldland Common, Willsbridge, Bitton, BS31, Keynsham, Stidham & Saltford.